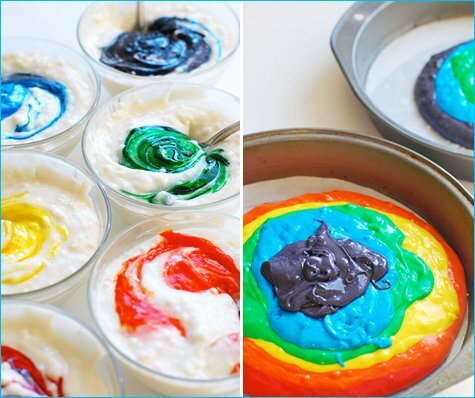 The Omnomicon has a fabulous step-by-step Rainbow Cake tutorial and the colorful pictures alone are positively drool-worthy! 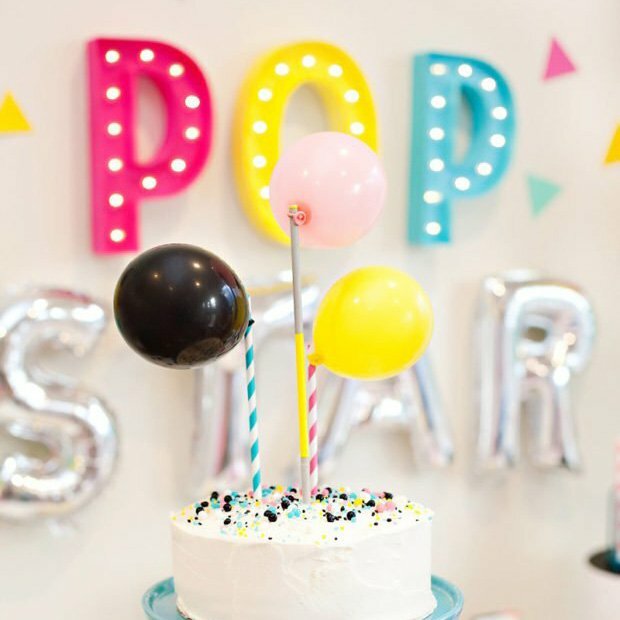 This recipe would be so much fun for a color party, a 60’s theme party, an art-lover’s birthday, or anytime you feel like brightening up the dessert table a bit. The baked cake looks so great it almost seems like it would be hard to cover it with frosting, don’t you think?! The pretty colors come through again when the cake is cut and served though (see top pic, above). For complete details, check out the full tutorial. Happy Baking! this is so cool looking! & yummy! i think i will make for my niece’s bday! 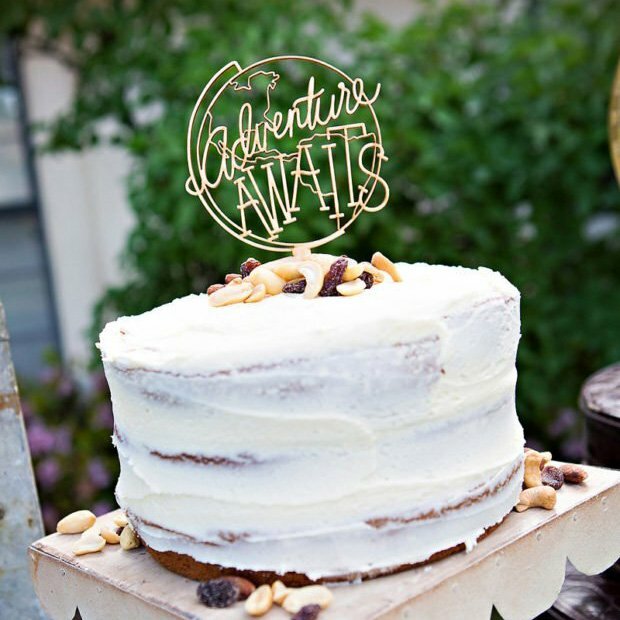 I LOVE this cake and these photos are simply amazing! 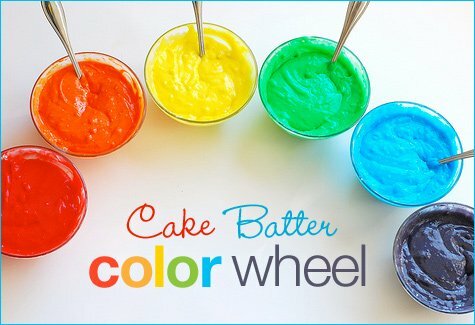 What a great idea, you could definitely apply this process and make a cake to match any party theme. NO WAY! I just made this cake a few weeks ago for my daughter’s art birthday party! I even took similar pix (not that awesome one of the batter rimmed bowls, though!). It got a HUGE wow factor response, btw! 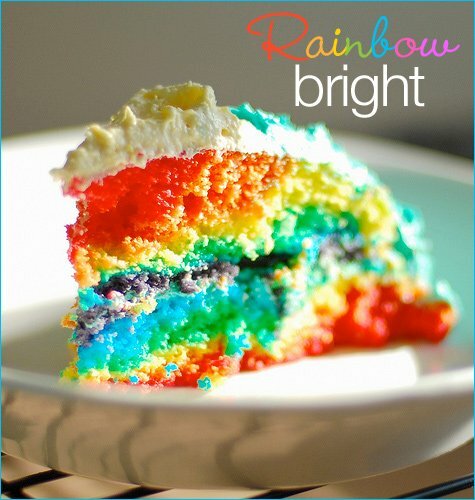 My youngest daughter always says that her favorite color is “rainbow” – she would love this cake!! wow, I am LOVIN’ that cake. this is absolutely fantastic! i am totally in love with this cake and can’t wait to try it. I have to make this cake! It’s too gorgeous not to!! I think I’ll make this for St. Patrick’s Day – pot of gold at the end of the rainbow. Love it! 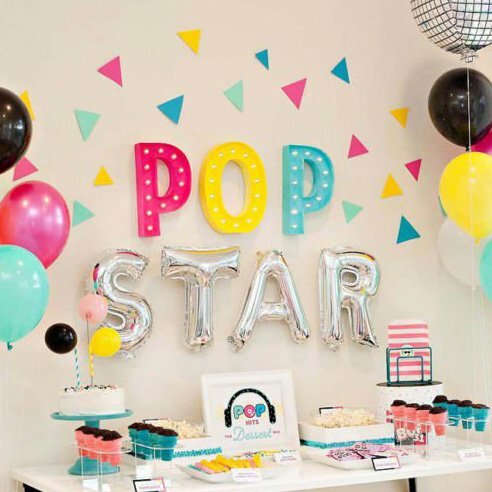 Okay, seriously, I subscribe to this the hwtm blog, I never plan a party without a consultation with hwtm, and even made it out to the Boston Hostessing event. OMG! This is the coolest cake ever! Is this for real ?!! the kids will be bouncing off the walls with all them E numbers?!!? This is soooo great! I have been wanting to make cupcakes like this for a while!!!! WOOOOOOOOOO THANKYOU! Thank YOU so much for creating such a great tutorial to share! Your pictures turned out awesome! This is color lover’s dream dessert! Not sure I have the patience to make it, but just looking at it is very gratifying! The BEST dessert I’ve seen in a long time. I can’t wait to make it!! Coolest cake ever!!! Love it! All that food coloring doesn’t change the texture or the taste does it? This is the best idea. 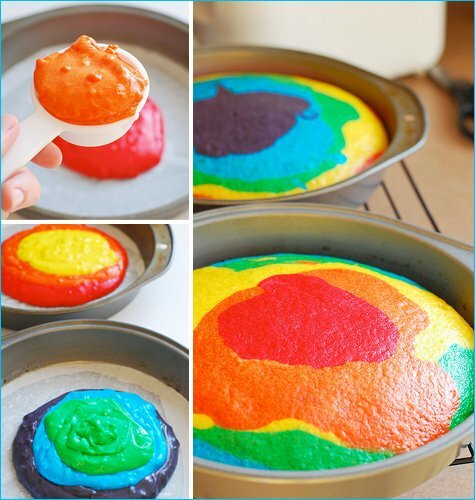 My son will LOVE this bright colored cake. What a great idea! That looks so yummy, I wish I could have a piece of it right now! Just when I thought nothing was better than homemade cake, I see this and realized a pretty COLORFUL homemade cake tops it all! Thanks for the tutorial…I’m not too much of a baker, but this looks like it’s definitely worth trying! Cool recipe!!!!!! :D I’ll definitely bake that cake! Very cool cake…can’t wait to make it for my little girls party!! The other moms will be so jealous!! This is Fabulous!!! My kids are all grown, but I will be making this soon for SOMEONE ~ ANYONE!!!!! 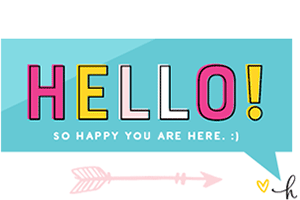 Thanks for sharing and I am soooo GLAD I found your Blog – it’s wonderful! My mother used to make cakes like this for my sisters and me when we were little. She would make it more like a quilt with the colors side by side. Her colors were not this bright, though. My friends loved it! I also feature cooking on my blog for the financially challenged and also wheat and gluten free. I just made this cake last night, and it was quite easy, and looks absolutely beautiful! I enjoyed every step of the process, but now the only problem is that it is so pretty I can’t stop eating it! I still can’t get over how good it looks. how did you get such a shiny top? is it the lighting you are using? this is a great and delisious recipe!!!!!!!!!!!!! 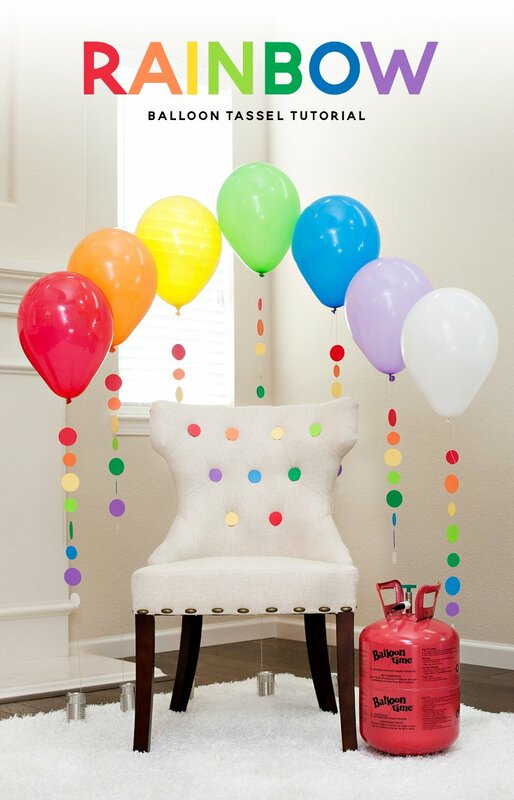 This is wonderful for my party! For my 14th b-day, I’m having a rainbow themed b-day, this article helped alot! I’ll tell everyone who asks about it. This cake was a big hit at my son’s 1st birthday. 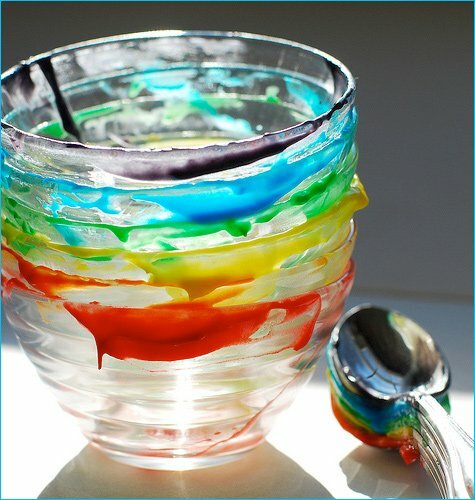 Just a warning, though: if your child hasn’t been exposed to food coloring yet, be wary! We spent the rest of his birthday in the ER treating a serious allergic reaction. Ok, I don’t wanna sound crazy. First, I had a camp at the end with potluck day, YUM, and we had to chose deserts. So i was looking for something wacky. So, i went with this cake. WOW, it look beautiful and I hope everyone likes it tomorrow!! I am still waiting for it to get out of the oven but it is very easy but the only thing is that who ever wrote this wasn’t that specific enough for me. I had some troubles, but thanks. 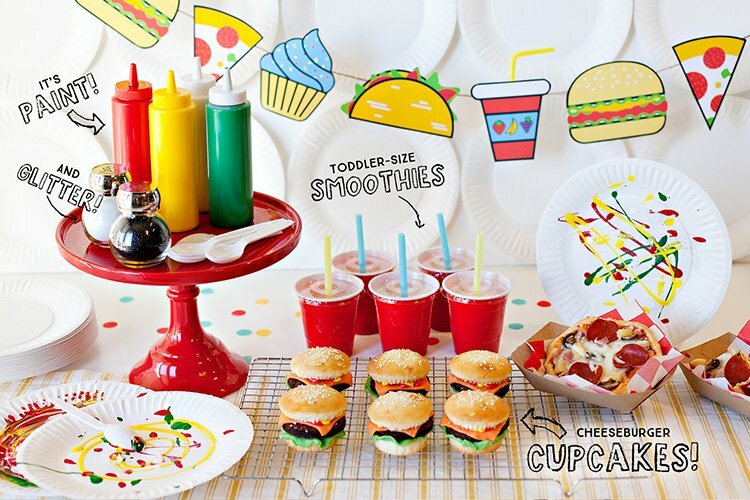 Oh gosh that looks A) yummie B) really cool! I think I may make this at my fisrt House Welcoming Party! Baking in my new kitchen Wahoo! i love this cake made it lots of times!!! going to make it again soon!!! I made a very large cake w/ 2 10″ 2 8″ and 2 6″ layers, and the icing was very bright a diff on each layer, and when we cut into it ALL the girls and their parents were full of oohs and ahhs….. Not once did I hear that there were too many artificial colors in it and that their child was going to die from it.. It was a GREAT success…… beautiful job!! hi this is an amazing cake!! i cant wait to try it!! ive never seen a cake with soda in it! please email why the soda is involved if you have any time on your hands!! i love it (: super awesome! gr8………cool………. yummy……………..i made it on my frnds birthday…………….lovely………. Superb!! awesome pictures as well! I made this tonight with my mom for my birthday…. And well lets just say…… TOTAL FAIL!!! I was soooo disappointed! The cakes cracked and crumbled everywhere taking it out of the baking pans. I don’t know if whoever put the instructions on here maybe left some steps out or what… But something is NOT right.. I followed the directions perfectly.. and like i said failure. Taste good, but looks HORRIBLE. And the recipe makes way too much icing. Somebody needs to redue the recipe… Sorry, but if you can’t tell I’m a little upset… We spent hours doing this and the way it turned is sooo not like the picture. I do not recommend to anyone. I like this page MUCH! Lackling inspiration, I googled ‘fabulous cake’ and that is exactly what I got. THANKS SO MUCH – can’t wait to get baking!